I've always thought that traders were just kids playing with paper planes inside huge buildings, drawing some meaningless lines that rules the world. Well, it might be true. Flying Stock Exchange is my submission to this month Experimental Gameplay Project's theme Economy. 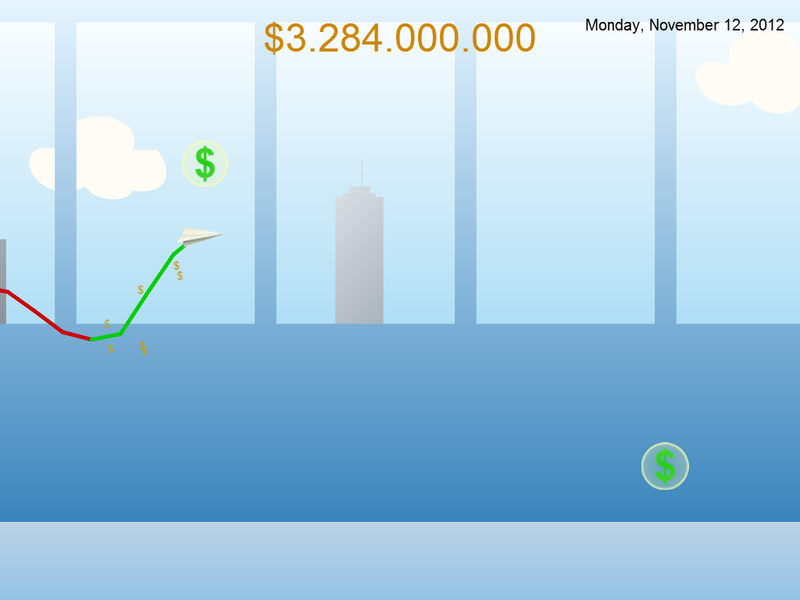 The game illustrates the paradox of over-seriousness and great liberty in the financial industry. The first playable version had an horizontal gameplay: the plane had a speed, suffered friction and even stalled on low speed, but could speed up again thanks to bonus. I haven't liked it. 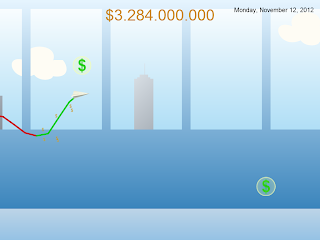 I've wanted to focus on the vertical gameplay, allowing to plot a chaotic price curve. The horizontal axis is a timeline and that makes no sense to manipulate it through acceleration or friction. Therefore the plane has a constant speed. There is no progression in the game's complexity: it is eventually possible to gain money by collecting every bonus item, but doing so is quite difficult and the player always looses money on average. The score is thus the delay she manages to keep before the inevitable crash. I used LimeJS again. The game is really simple, it just has a small number of nodes, animated within a game loop. Everything is rendered with DOM elements, except for the trail, which is dynamic and therefore should be drawn with a canvas. LimeJS is a framework, and as I made the game within three days, everything is hardcoded. Last weekend I heard about CraftyJS, which is more like a game engine: there are entities, components, events. I'm really interested in doing a project with it. A clear advantage of LimeJS comes in its animation handlers, that's why I mean that it is very suitable for user interfaces, not games in particular. I've wanted to represent traders as children playing with paper planes, observing their flight to speculate on the market. If you're a trader, don't take it personally, I know you're not allowed to throw a paper plane in your office! Mouaaahaahaah! Anyway the guy was well-dressed in the first version, but I really wanted to emphasis on the childhood. At the end he's cute in diaper, don't you think? At first the background was very desaturated, almost white, but after an argument about it with a friend, colors are now brighter. The blue background contrasts well with the green and red foreground and the orange kid. The "music", actually just a synthetic wind, gives a sensation of calm and liberty. The chimes playing when collecting a bonus reinforces the childhood side. Note that their is no advanced mechanism handling audio in LimeJS and we have to trick volume in the game loop to emulate fades.